If looking for something that will allow for large jobs to get done, covering lots of miles or for cargo deliveries than look no farther than the Ram ProMaster City cargo van. The next-generation 2019 Ram 1500 showed truck owners that it can get any job done. The next-generation Ram HD trucks, the 2500 and 3500 heavy-duty pickup trucks are there to get any job done. Four trims make up the 2019 Ram ProMaster City lineup. The four trims are made up of Wagon SLT, the Wagon, Tradesman SLT Cargo Van, and Tradesman Cargo Van. Every available trim comes with a front-wheel drivetrain and a 2.4-liter Tigershark MultiAir l4 engine under the hood and is capable of generating a best-in-class horsepower of 178 horsepower and 174 lb-ft of torque. The engine in the Ram ProMaster City is optimized with variable valve timing (VVT) system for better performance and paired with a nine-speed automatic transmission. Together, the overall powertrain earns the ProMaster City a best-in-class highway fuel economy of 28 mpg. It also has the best-in-class payload of 1883 pounds and has a maximum towing capacity of 2000 pounds. ProMaster City hasn’t changed its style much in years; there’s still plenty of standard features. Included are a 180-degree opening rear hinged door, passengers and drivers side door and rear doors without glass, remote keyless entry, and security panels for the sliding doors and rear doors. As for upgrades, select trims have the option of windows with vented glass or deep tint sunscreen glass, power heated exterior mirrors, adjustable roof rack crossbars, roof rack side rails, and a three bar utility roof rack. All vehicles have 16-inch wheels, steel or aluminum. And consumers have the opportunity to give their van some personal style with these colors: Deep red, Blue Nite Metallic, Black Metallic, Silver Metallic, Bright White, Earth Brown, and Quartz Grey Metallic. Decals and custom paint jobs come down to aftermarket retailers. Consumers have the option to get a different interior depending on the trim; the Ram ProMaster City cargo van seats two and has a large maximum cargo capacity of 131.7 cubic feet. 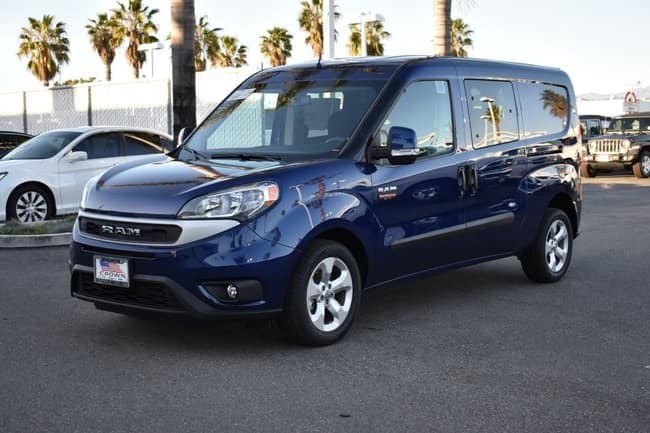 The ProMaster City wagon van seats five and has a maximum cargo capacity of 101.7 cubic feet. Both versions come standard with a 60/40 fold and tumble rear seat, a cargo compartment, cloth upholstery, and a rearview day/night mirror. Some trims come with additional options, such as a GPS antenna input for navigation, front all-weather floor mats. Also included are LED cargo area lighting and two cargo packages that make storage and organization more accessible. Thanks to Upfits, ProMaster City can be customized for several jobs. 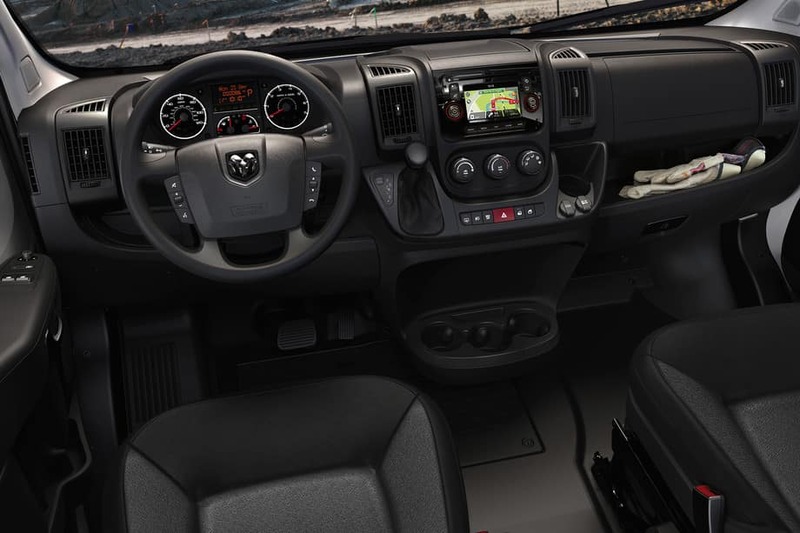 The 2019 Ram ProMaster City has a standard 4-speaker system with a 5-inch touchscreen display, integrated voice command with Bluetooth, Uconnect 3, steering wheel mounted audio controls and a media hub. In select trims, consumers have the opportunity of upgrading to a Uconnect 3 with navigation. For custom setups, make sure to check out the rear speaker wiring in uplift packages. For 2019 Ram ProMaster has many standard safety features. It has ParkView rear back-up camera, advanced front airbag system with side-curtain front airbags, stability control systems and remote keyless entry for convenience. As an option, safety features include a DOT (Department of Transportation physical examination) certified roadside safety kit, speed control, security alarm, an electronic vehicle tracking system and ParkSense rear park assist. 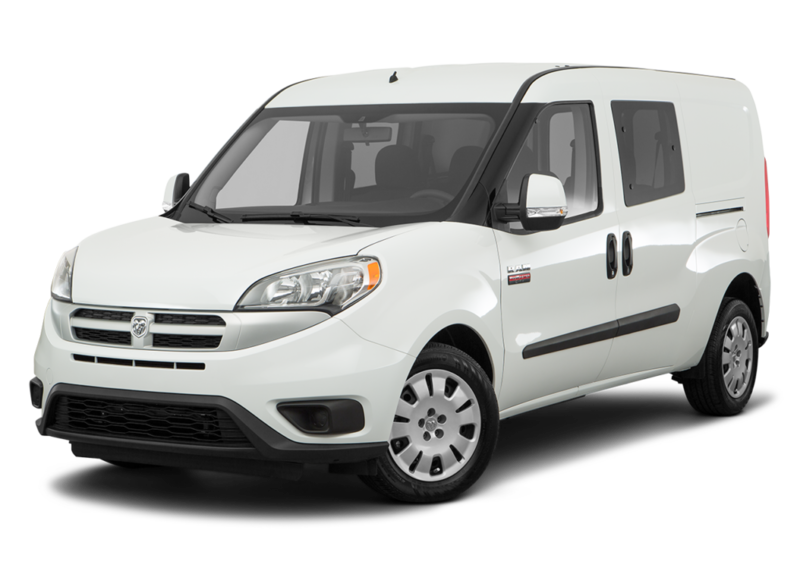 All Ram ProMaster cargo vans have the following warranties covering it: included are a 3-year or 36,000-mile basic warranty, a 5-year or 60,000-mile powertrain warranty, 5 years or 100,000 miles of roadside assistance, and a 5-year/100,000-mile rust-through coverage plan.